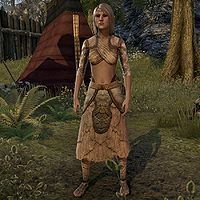 Rinareth the Wanderer is a Bosmer brewer selling her wares at her stall, The Practical Traveler, located at Jorunn's Stand. She's at the tent just to the left of the entrance when entering the gate from the wayshrine. "My oh my, these soldiers sure are a thirsty lot! I can hardly keep up with the demand!" This page was last modified on 5 August 2018, at 00:00.